The primary documents involved in an Arizona residential real estate sale/purchase are listed below and the list items are links to document samples. The dates at the end of list items indicates the version of the document, assisting us in our efforts to maintain current versions on this website. Listing documents, the first two, originate with ARMLS, the Arizona Multiple List System, and are relevant only to Realtors®. All the other documents originate with AAR, Arizona Association of Realtors®, and are available for purchase by the public at a very nominal fee. These are legally binding documents totaling more than two dozen pages, so the following discussions are NOT comprehensive. For the Purchase Contract alone, for example, The Neal Team – TNT have been in continuing-education classes that total more than an hour per page. Listing Agreement – the seller is agreeing here to a good number of issues regarding access, condition, security and other aspects of the property all of which are important to the success of the sales effort. Highlighting these would provide a good starting checklist for preparation and presentation of the property. Likewise, the Short Sale Addendum to this agreement highlights some of the special issues regarding short sales. Sellers need to be fully aware of the commission to be paid to the buyer’s broker by the listing broker as specified in Section 6 of the Listing Agreement. Otherwise, listing agents commonly offer less than 50% of the total commission to buyer brokers. To some degree, this will be a detriment to “traffic” to the property. A reduced commission offering is NOT in the seller’s best interest. 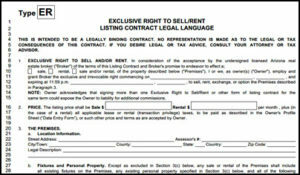 The sample here is the “ER”, Exclusive Right, form of the listing agreement. With this the agent identified in the form is the one and only, exclusive, agent for the seller and to whom a commission is to be paid when/if the property is sold. There is also an “EA”, Exclusive Agency”, version of the form that is largely the same except that the seller reserves the right to find a buyer themselves, totally separate and apart from any agent, and thereby not be required to pay any commission. The muddle this EA agreement creates is obvious. The yard-sign, advertisements, etc., by the listing agent are likely to be the driving force behind any inquiry made directly to the seller. Plus, the most serious complications start when the offer is submitted. Who manages the transaction? What if the transaction becomes a disaster for the seller? Because of the inherent muddle, the vast majority of Realtors will not even consider an “EA” listing agreement. Listing Agreement Short Sale Addendum – Ultimately, the seller’s lender will have indirect control of the sale transaction, and will be the major factor affecting the time required for seller and buyer to establish an agreement on the terms, conditions and price. This form documents the essential nature of a short sale, the unique role that the lender plays, and the extra time the transaction is likely to take, with the primary purpose of making the seller fully aware of the ordeal he/she is likely in for. Buyer Pre-Qualification form – is submitted with a purchase offer that involves financing, but the quality of the “pre-qualification” can vary tremendously. The form can indicate, for example, that very little has actually been done to determine the financial capacity of the buyer. If so, the buyer needs to be told to go get a Pre-Qualification that means something. Further, a good listing agent should call and interview the lender issuing the Pre-Qualification to get some feel for the quality of this document and the true financial capacity of the buyer. it has evolved over decades. it is involved in a VERY LARGE number of transactions on an ongoing, everyday basis so it “works” … in terms of coverage of the issues and being consistently “understood” by people in the industry. In evaluating purchase offers, sellers should consider the sincerity of the buyer first and foremost … not price. Considering all factors and issues … how likely is the buyer to close the deal? This is especially true in a short sale situation. If the conclusion is that the buyer is likely not to be able or not willing to ultimately close, it may be wise to reject the offer … irrespective of the price. HOA Addendum to Purchase Contract – HOAs, Homeowner Associations, are unique and complicated, not only in terms of the CC&Rs, but also in the nature and amount of transaction and on-going fees. Of course, many properties are not part of a HOA. Because of these issues, the AAR Purchase Contract uses an addendum to disclose, as part of the purchase agreement, what each and all of these fees is, and to specify who pays what … where that’s not set by Arizona statute. See page 2 of this document for an explanation of this last issue. Short Sale Addendum to the Purchase Contract – lines 9 to 12 reflect the essence of the situation. 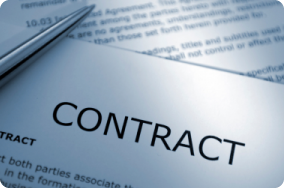 There really is no “contract” until the seller and seller’s lender reach agreement on the terms and conditions of settlement, which VERY often involves renegotiation between the seller and buyer over the sale price and/or other contract terms and conditions. This usually takes at least a few months from submission of the short-sale package by the list agent to the lender, and can take many months. In considering an offer, sellers are advised to evaluate the buyer first and foremost on the basis of patience … is the buyer willing and able to wait, possibly many months, until the lender gets around to evaluating the short sale offer. The second buyer evaluation factor concerns flexibility regarding price … what if the lender counters to a significantly higher price … commonly done in a rising market. A “low-ball” contract price with an “investor” buyer is likely not going to close. Look for another buyer. Sellers-Property-Disclosure-Statement – SPDS – referred to as the “spuds”, has long-term risk for the seller … yet it is usually filled out very rapidly and with not a great deal of thought … NOT a good idea. Even years after the transaction closes, if this document is found to be not true and in a material way, the seller is likely liable for any costs associated with the issue. As indicated on the cover page … DISCLOSE – DISCLOSE – DISCLOSE … you will likely be “off the hook” for anything mentioned here … and forever “on the hook” for any material issue not mentioned here. Buyers Inspection Notice and Sellers Response – BINSR – referred to as the “binzer”. The seller needs to be aware that the transaction is somewhat questionable until the inspection process is completed. The nature of BINSR that the seller gets from the buyer is largely “the ballgame”. If the items listed in the BINSR for repair or replacement are few and not significant, the “game” outcome is largely determined. If the items are many and/or significant and costly, the seller has some decisions to make. * Escrow - What is it? Agency - What is it?